RPJ Racing | Searing pace but no luck for Rick at The Rock. Rick Parfitt Jnr came to Rockingham full of confidence with both he and Tom Oliphant known to be extremely quick at this circuit. 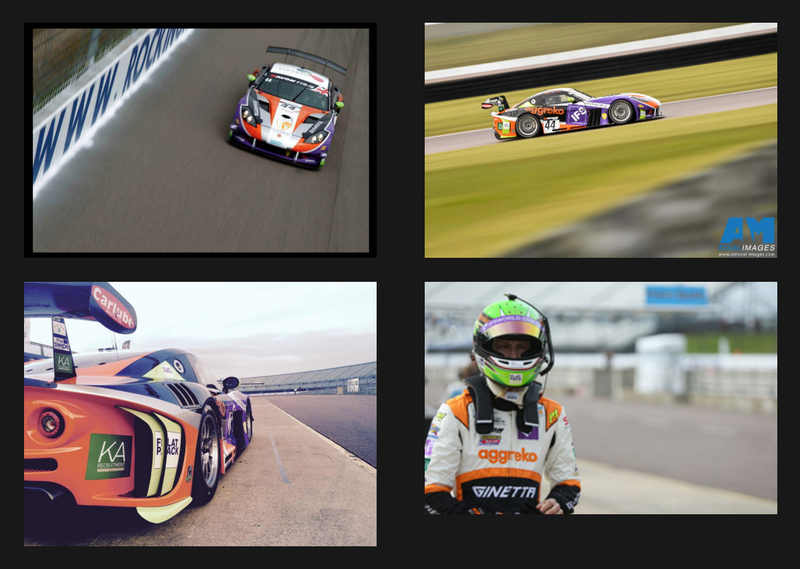 Parfitt had at some point led every race he has ever competed at the circuit in GT5 and GT4. In practice it was evident that on low grip old tyres the #44 Ginetta was a force to be reckoned with Rick posting the fastest unofficial times against competitors running similar tyres. In qualifying trim the team decided on a stiffer set up but struggled for ultimate pace on the new tyres with Rick posting a time that put him 9th and Tom 14th in their respective sessions resulting in a disappointing 12th on the grid, however Rick was full of confidence for the start of the race knowing that on low grip the race would come to them. Parfitt’s strategy proved right as he immediately overtook the FF Corse Ferrari on the outside of turn 1 and then promptly out braked the Ram Racing Mercedes SLS of Alistair Mckinnon into turn two, a great start! He then set about chasing the Mclaren of Salih Yoluc who subsequently grossly misjudged his braking point and not only hit the 888 BMW of Lee Mowle but continued to side swipe his team mate Ross Wylie in the sister Mclaren eliminating both Mclarens on the spot. The #44 Ginetta managed to avoid the ensuing carnage and immediately lined up to draft past the 888 BMW. With this done and now in 7th place he set about chasing the Aston of touring car ace Liam Griffin. Hampered by a short safety car period Rick was straight onto the bumper of the Griffin Aston Martin and hurled his Ginetta GT3 down the inside under braking into turn 1 elevating him up to 6th. He then set about chasing the leading pack with no more than 3 former champions in it!, Rick responded by posting the fastest lap of the race thus far and was the man on the move until disaster struck with the alternator failing resulting in a complete loss of power. Despite only being able to use 2nd gear Parfitt managed to bring the #44 car into the pits but lengthy repairs dashed any hope of a good result. After a long period in the pits with the team replacing the alternator the no.#44 car returned to the circuit only to suffer a huge tyre blow at over 150mph.